Like the United States, Canada had its own "Big Band Era" but lacked a flourishing record industry to make its musicians famous. Aside from photographs of the 1920s of handsome young men in tuxedos holding musical instruments, there are no souvenirs of those days and few survivors to remember them. The four Lombardos of London, Ontario, born Canadians (later becoming Americans) are in that" Big Band Up in the Sky" --as are Luigi Romanelli and his brother Don; Bert Niosi and his brothers Johnny and Joe; Stanley St. John, and others with revered names. Apart from the Lombardos who churned out hundred of records in the States, Canadian tooters remaining had few if any opportunity to make records which Canadian radio stations could play to promote their names and their brand of music. Nor, with the exception of the Mart Kenney Orchestra is there a full finger-count of CDs derived from Canadian records of the 30s and 40s. Until the 70s, Canada had yet to become a producer of recordings for the international market. Johnny Burt helped to bring about a change but that day had been a long time coming..
Johnny Burt was a survivor of Canada's Big Band Era. Born in England in 1914, Johnny came to Canada with his parents who settled in Toronto. There, he took up the piano, and in the early 30s, started working under some of the legendary band leaders who played for moonlight cruises on Lake Ontario, in the Oak Room of the King Edward Hotel, the Imperial Room of the Royal York Hotel, at the Casa Loma, the Hunt Club, the Silver Slipper, the Top Hat, the Club Norman, the Palais Royale, Dunn's Pavilion in Bala and the Brant Inn in Burlington. Johnny was with the Luigi Romanelli Band when for several summer seasons it took leave of the King Eddie's Oak Room to play at the exclusive Manoir Richelieu in Murray Bay. The bands, and the ballrooms and hotels in which they played, gradually became familiar names to radio listeners across Canada when the Canadian Radio Broadcasting Commission (CRBC) Network was set-up in 1933. Lacking sufficient funds to hire musicians to fill its schedule, the CRBC (later the CBC), at no cost to the network, began to pickup up the bands as they played for diners and/or dancers. It was during this era that Johnny Burt began composing music and making orchestrations for dance bands and for radio shows. 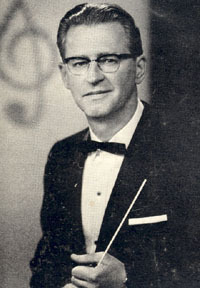 He wrote arrangements for Jack Shaindlan and Paul Whiteman in the United States and for a host of top Canadian vocalists. In the Spring of 1937 Johnny was playing piano with the famous Trump Davidson band at the Club Esquire when Ray Noble brought his all-star Rainbow Room orchestra from Rockerfeller Centre for a two-week stint at Toronto's Shea's Theatre --- its last public engagement. Ray came to the Esquire and listened to the Davidson band. Impressed, he later approached Trump with an idea. Ray had made hundreds of records in England but had never led a band in public in his native land. Ray decided to set-up an extensive tour of the British Isles to begin in Glasgow on June 6, 1938. He needed 14 Canadian musicians (to which he would add 3 Britishers). The deal was made and on May 4th the band sailed from New York on the Normandie. On the stage, as the curtain rose, a spotlight would focus on Ray at the piano playing his theme - The Very Thought of You. Johnny would then slip into his place for the 45-minute performance as Ray picked up his baton and took over the microphone. The tour ended in September and Ray returned to the States for the Charlie McCarthy radio show. Johnny stayed on, and because he was London-born, was able to immediately join the British Musicians Union. Johnny went to work for Canadian bandleader Billy Bissett when he opened an engagement at London's Cafe de Paris. Then, came WW II and Johnny returned to Canada to join the Navy. In 1962, Johnny Burt began a new career. During the morning and afternoon of July 27th, he was in the RCA recording studio on Mutual Street in Toronto, conducting two orchestras comprised of 18 top Canadian musicians, playing his arrangements of 24 alltime favourite songs. They were taped in stereo in a total of 6 hours, These were the first of over 2.500 tracks to be recorded over the next 20 years that were produced by The Canadian Talent Library (CTL) essentially for broadcasting on private Canadian radio stations. Involving hundreds of Canadian musicians and dozens of singers from across Canada, the CTL albums, brought a "Canadian presence" to the programming of radio stations in Canada, the United Kingdom, the United States and Australia. Johnny went on to make his third CTL album (#14) in 1963, following which he was engaged by CTL to supervise the production of the next 150 albums. Johnny made an invaluable contribution to the success of the Canadian Talent Library and in demonstrating to the world that Canada had the talent and the sound studio facilities to compete with their contemporaries in the USA, the UK and other foreign countries. While Johnny continued to record for CTL throughout the 70s, he also arranged and conducted for recording sessions in Canada for international exposure by Muzak. World-famous Canadian arrangers Percy Faith and Robert Farnon with whom Johnny "grew up" in Toronto left Canada decades ago to pursue rewarding careers in the USA and England. Fortunately, Johnny stayed in Canada and made a vast contribution to the development of Canadian radio and TV programming, the Canadian recording industry and to Canadian musicianship. Had he lived into the 80s or 90s, undoubtedly, Johnny Burt would have been recognized by the Order of Canada, as since have several of the musicians and singers he recorded. Johnny Burt died of cancer at 66 years in September, 1980. Fortunately, his music lives on, but, unfortunately, only on the records in the care of the National Archives in Ottawa and in treasured copies held by his friends and admirers. These records also stand as the only testimonial for many of the professional and exceptionally talented musicians, performers and composers of Canada of the 20th Century -- most of whom have joined the "Big Band Up in the Sky".